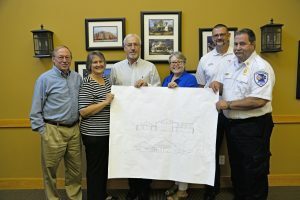 Mike Baker, Barb Ooley, Jim Murphy, Nikki Gastineau, Matt Bright, and Joel Bomgardner hold renderings of the future fire station. Bloomington, Ind. – Today, Cook Group announced a two-acre land donation to the Washington Township fire department. The land will become home to a new fire station that will service the area west of the I-69 expansion. The deed to the land donation was signed on Wednesday. In addition to land, Cook donated engineering and architectural services for the future fire department. About Cook Group Cook Group is owned by the Cook family. It is the parent company to several Bloomington-based businesses including Cook Medical. Since 1963 Cook Medical has worked closely with physicians to develop technologies that eliminate the need for open surgery. Today we are combining medical devices, biologic materials and cellular therapies to help the world’s healthcare systems deliver better outcomes more efficiently. We have always remained family owned so that we have the freedom to focus on what wecare about: patients, our employees and our communities. Find out more at www.cookmedical.com, and for the latest news, follow us on Twitter, Facebook and LinkedIn.